Lisbon Portugal is an exciting destination for travel in Portugal. But finding the best day trips from Lisbon Portugal is part of the fun of travel in this exciting city. Sure, there are loads of things to do in Lisbon, and some people might never want to leave. But for those with a desire to explore, there are countless side trips from Lisbon that will leave you full of wonder and amazement. Within a short drive or transit trip from Lisbon are unforgettable castles, ancient cities, dazzling beaches, and even dinosaur footprints! So if you’re looking for amazing Lisbon day trips, you’ve come to the right place. Lisbon makes an amazing destination to base yourself while exploring the southern half of Portugal. 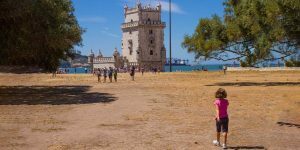 Not only is the city itself thrilling and full of adventure, but there are so many things to do near Lisbon that it can be almost overwhelming. And while there is a huge number of day trips from Lisbon, these are our favorites. One of the most popular day trips from Lisbon is the beautiful and exciting resort town of Cascais. Cascais is 25 km (15.5 miles) west of Lisbon and can be reached easily by highway or by traveling on the Cais do Sodre-Cascais railway. While the drive to Cascais from Lisbon gets you there quickly, the coastal train offers incredible views. 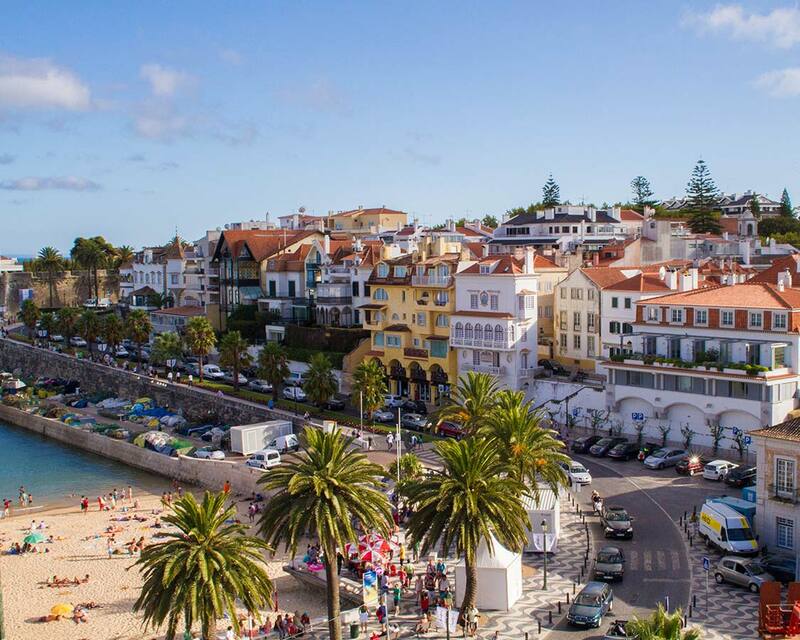 The city of Cascais itself is a perfect mix of history and modern comfort. The city has been a popular seaport since medieval times before it’s beautiful seaside location caught the eye of nobility in the 19th century when King Luis I made Cascais his summer residence. Cascais was actually our home base during our travels in Portugal. It’s proximity to the capital, and a lively atmosphere made Cascais a perfect experience for our family trip to Portugal. The historic center of Cascais is paved with patterned cobblestones. There are countless cafes, excellent restaurants, and trendy shops lining the narrow roads and broad squares. It’s easy to spend a day or more in Cascais. But there are a few things you must experience when you make this day trip from Lisbon Portugal. The Citadel of Cascais, Palacio da Cidadela, was built between the 15th and 17th century to defend Cascais from invading fleets. Make sure to explore old town Cascais and get lost wandering the historic streets. Also, explore the waterfront past the Citadel to see modern mansions and fisher’s cottages lining the waterfront. From the sites here, it’s easy to see that Cascais is the wealthiest city in Portugal. You can also walk along the Marina de Cascais and on to the Santa Marta Lighthouse and its quaint museum. Cabe do Roca, just north of Cascais, and easily combined as a single day trip from Lisbon is the historic Cabo de Roca. Cabo de Roca is the westernmost point of mainland Europe. This point was once considered one of the 4 corners of the Earth back when the world was believed to be flat. Standing on the windswept cliffs of Cabo de Roca, it’s not hard to understand why this spot had such a historic position. The ocean seems to drop off dramatically in the distance. 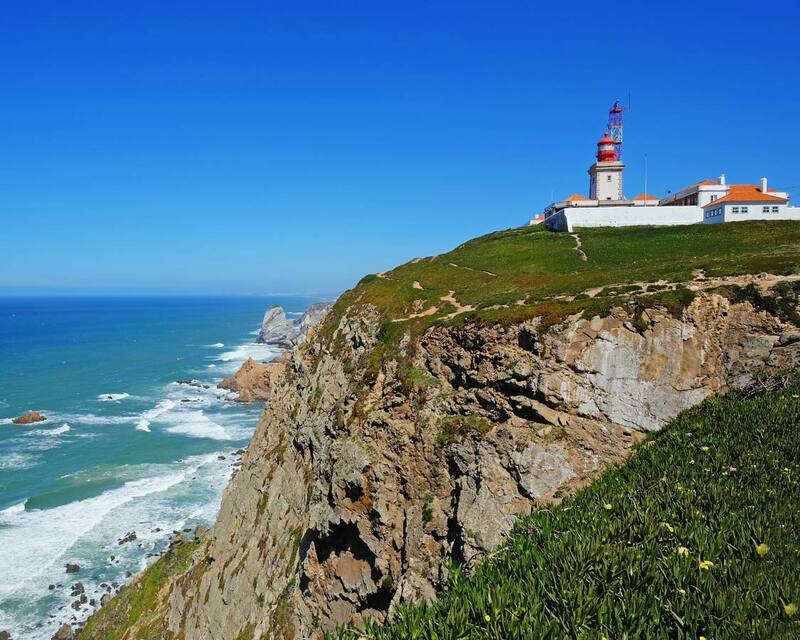 Cabo de Roca boasts a pretty lighthouse as well as a monument to its history. You can reach the point by car or take bus 403 from either Sintra or Cascais. Close to Cascais, but well worth a day or more on its own is the picture-perfect city of Sintra Portugal. Sintra may be the most popular day trip from Lisbon, and it’s an honor that it rightfully deserves. Sintra is just 30 km (18.5 miles) and is connected by direct train route from the Rossio railway station in Lisbon. The landscape of Sintra is rough, lush, and dramatic. And the natural beauty of Sintra is matched perfectly by the majestic castles and palaces that dot the city center and hilltops. Sintra has something for everyone, from ancient history to colorful buildings. It’s truly like walking through a fairytale book. 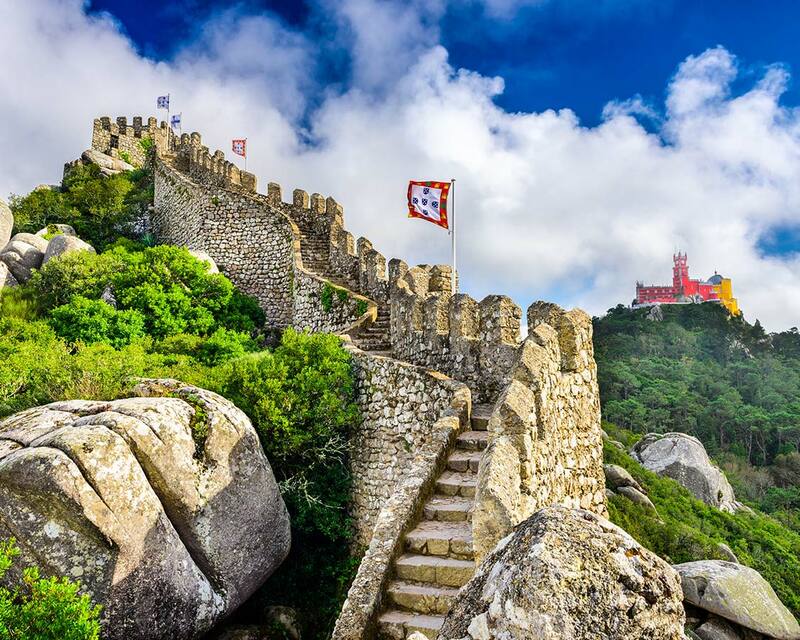 Sintra, this majestic UNESCO World Heritage city is packed with incredible sites. The Sintra National Palace or Palacio Nacional de Sintra is a great place to start. The 14th century Sintra National Palace is right in the center of old town and can’t be missed. It’s two towering chimneys rise high above the skyline and can be seen from most places in the city. This building was once the home of the Portuguese Royal family. If you don’t mind a walk, you can stroll the Sintra gardens up to the Moorish Castle, or Castelo dos Mouros. This 8th Century ruin stands at the top of old town. Not only is it incredible to explore on its own but it also offers one of the coolest views of the colorful Pena Palace. 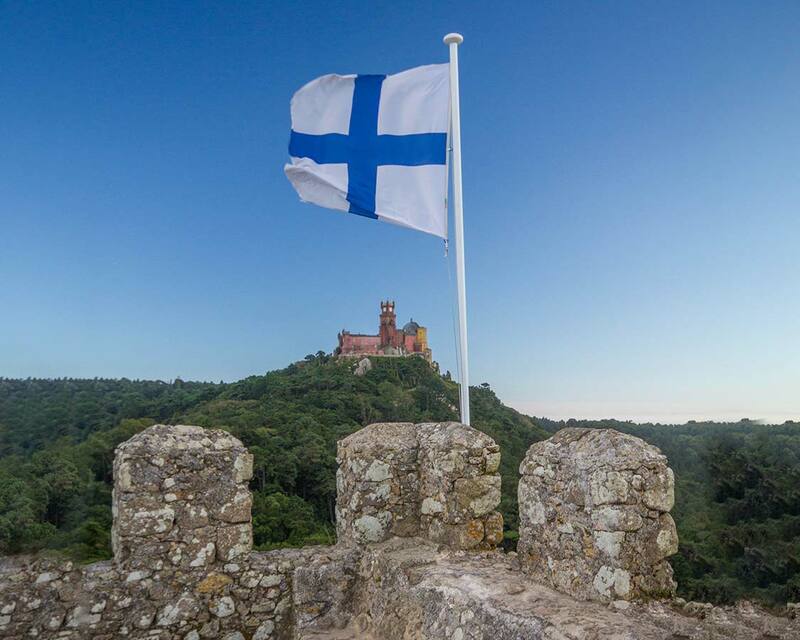 The battlements are lined with flags, and the surrounding National Park is always a lush green. 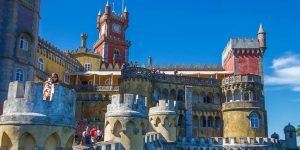 The artistic Pena Palace, or Palacio da Pena, is the highlight of most day trips from Lisbon to Sintra. This picture-perfect fairy-tale castle is reached via a beautiful woodland trail or by bus. Pena Palace was built in the 19th century and became a popular retreat for vacationing nobility. The interior is opulently decorated, and the views are surpassed only by those of the Moorish castle. If you want to get a glimpse into royal life in Portugal, you must visit the Queluz National Palace or Palacio Nacional de Queluz. 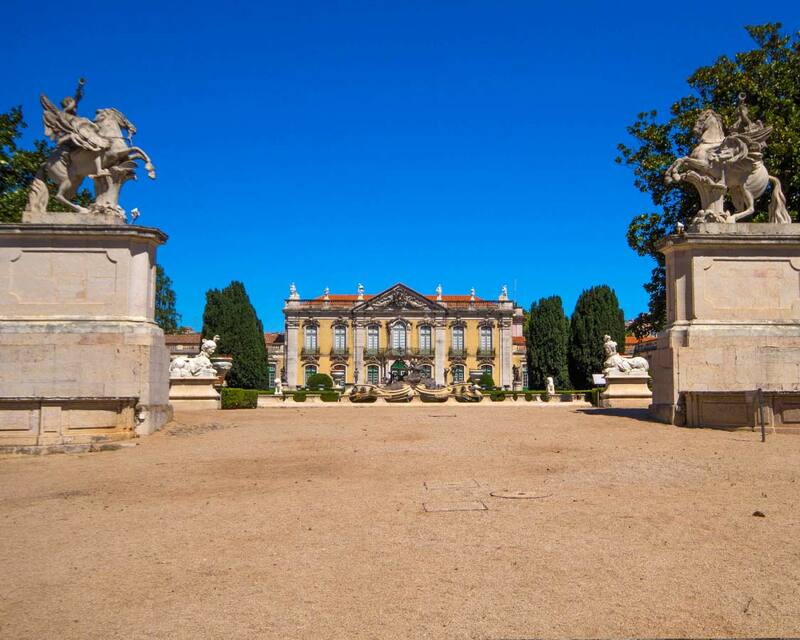 This 18th-century palace was constructed over 45 years for King Pedro and stands out as one of the most fantastical palaces in Portugal. The National Palace of Queluz combines Baroque, Rococo, and Neoclassical architecture and design. Queluz National Palace is a short 14-km journey from Lisbon and can be reached on the Sintra train line from Rossio station. This gorgeous complex was designed to marry both landscape and architectural design into a seamless experience. Often referred to as the Portuguese Versailles, Queluz National Palace is as much a residence as it is a carefully crafted piece of art. The grounds of the palace are dotted with moss covered waterfalls, grottos, and peaceful canals. The gardens of the palace also feature incredible sculptures by renowned English sculptor John Cheere. Inside the Queluz National Palace are grand rooms decorated with lavish chandeliers, gold-trimmed mirrors, and famous paintings. The Throne room is one of the most famous rooms in the palace, and shouldn’t be missed. The Salo do Embaixadores is one of the most opulently decorated rooms and was a meeting place for dignitaries and diplomats. Evora is a short 1.5-hour train ride or car day trip from Lisbon. This beautiful city is a popular side trip from Lisbon for its incredible food scene and historic city center. From the 9 km (6 miles) aqueduct to the Evora Roman Temple, it’s clear where much of the ancient architecture of Evora originated from. The list of things to do in Evora keep adding up, and it may be worth spending more than a day here. 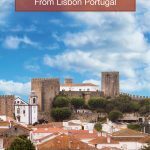 Starting your day trip to Evora from Lisbon, park outside the city and follow the path along the aqueduct into the walled city. Head to the Roman Temple, or Templo Romano de Evora which is, quite possibly, the most famous attraction in Evora. The brilliantly white San Francisco Church is a beautiful place to stop, as well as the Chapel of bones, or Capela dos Ossos. This tiny sanctuary is filled from floor to ceiling with bones exhumed from the nearby cemeteries. 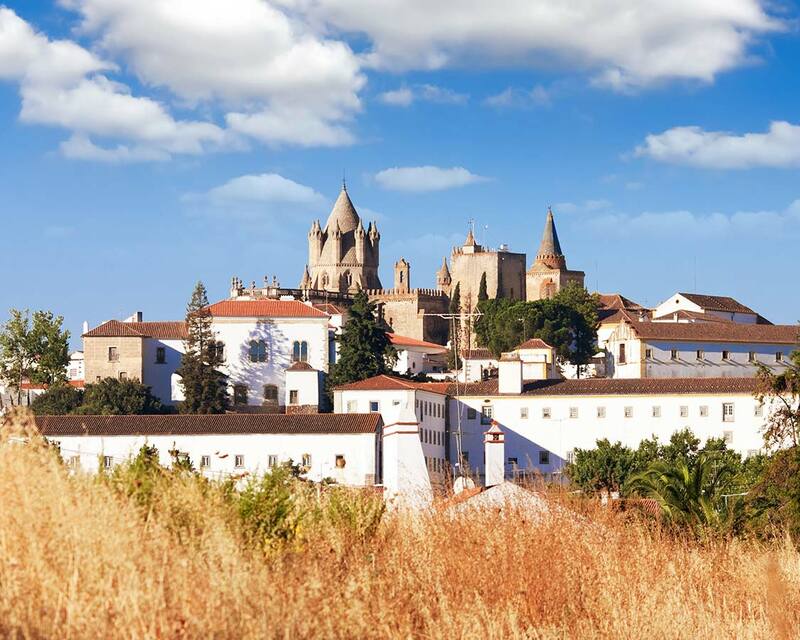 UNESCO has given the old town of Evora its World Heritage designation, in part because of these incredible attractions. Make sure to visit the Se, an imposing cathedral dating back to the 12th century. For Catholics, Fatima is the location one of the most important religious experiences in the world. It marks the location where three shepherd children reported sightings of the Virgin Mary back in 1917. They were asked by a glowing figure to return to the same tree each day for six months. Word spread, and by the end of the period, Mary had been seen 5 times and the three children were joined by over 70,000 pilgrims. The Vatican listed the experience as “belief-worthy” and in 1918 a small shrine was built. Over the years Fatima has exploded in size and is now on par with Lourdes France as one of the most important pilgrimage sites for Catholics. 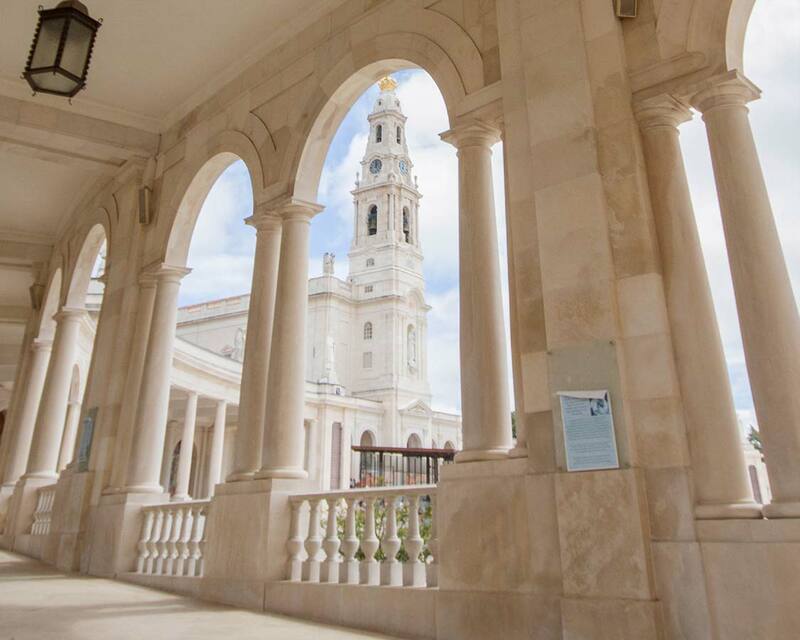 The landscape of Fatima is centered around the Neo-Baroque Chapel of Our Lady of Conception. This church was built on the location of the reported miracle. In front of the church is a massive square that is often full of worshippers. If you plan a mid-May visit during the pilgrimage, don’t even think of trying to get a hotel or a restaurant reservation anywhere near here. You’ll be competing with hundreds of thousands of parishioners. As a side trip from Fatima, less than an hour away you can visit the Natural Monument of the Dinosaur Footprints of Serra de Aire – Pedreira do Galinha. 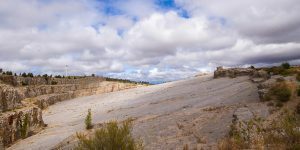 This massive open-air archeological site is home to some of the best-preserved dinosaur footprints in the world. 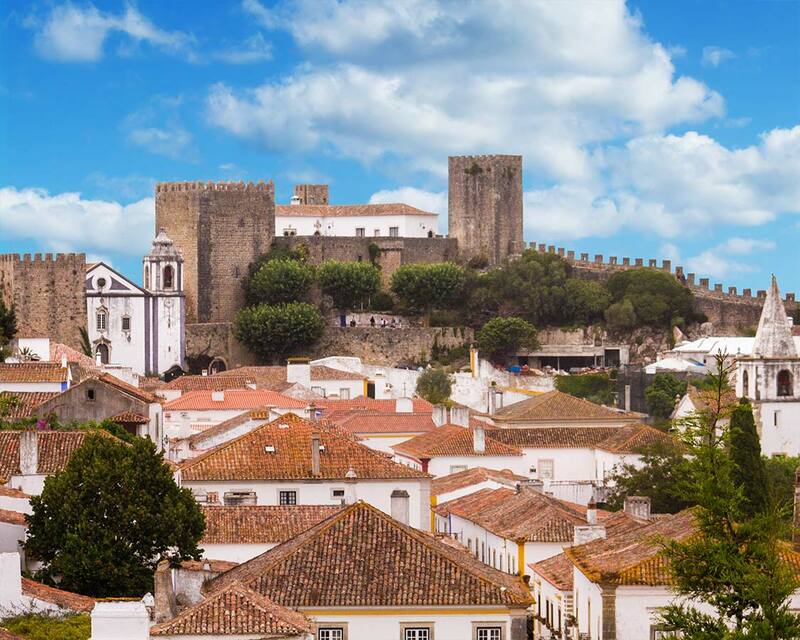 There is something very special about the town of Obidos. From the terracotta rooftops to the imposing castle backdrop, entering this walled city is like stepping back in time. 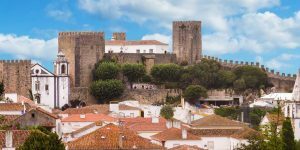 Obidos is the perfect destination for a romantic getaway, or for children to dress as knights and run wild in the flower-lined streets. Obidos is small enough that it can be explored in just a few hours, but it’s so beautiful that you may want to stay for the rest of your life. There is regular bus service to Obidos from Lisbon. If you drive, you’ll need to park outside the city. Cars are not allowed with the walls of Obidos. 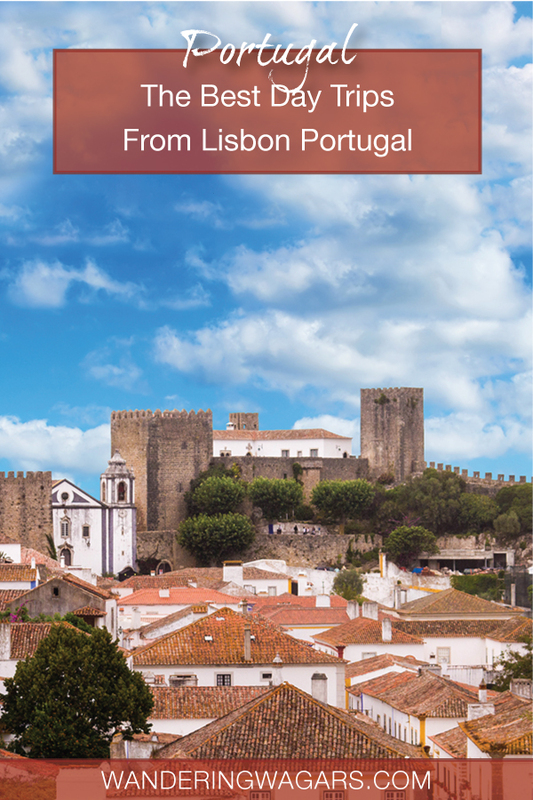 A great day trip from Lisbon to Obidos starts with the city walls. A stroll along these narrow fortifications will give you an incredible view of the town and its picture-perfect rooftops. Part of the charm of Obidos is the authentic feel of the city. But that charm comes at a cost of safety. There are no hand railings on the city side of the walls, so please watch your step. The Castle in Obidos has been converted to a boutique hotel. If you are planning a honeymoon in Portugal, this may be the most romantic place to stay. You can’t visit Obidos without having a drink or three of Ginjinha de Óbidos, or Ginja. This alcoholic drink made from sour cherries and served in a chocolate cup is a perfect way to relax after exploring the narrow streets of Obidos. One of the best places to taste it is at Bar Ibn Errik Rex. Just watch your head when you go in. The ceilings are low and cluttered! Portugal is full of incredible history. And Catholicism has been an integral part of the Portuguese identity for much of the last thousand years. It’s no surprise that some of the most incredible monasteries and religious fortresses in the world have popped up within this country. 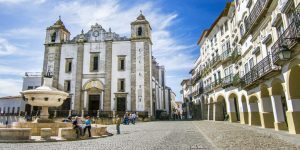 The cities of Alcobaca, Batalha, and Tomar are some of the most amazing monasteries of Portugal, and all three can be explored on a very packed day trip from Lisbon. However, if you want to slow down the pace, visit Alcobaca and Batalha one day and save Tomar for a second day trip from Lisbon. Alcobaca is just 100 km north of Lisbon. While it’s a bit far on its own, combining it with Batalha, and Tomar makes the experience a great side trip from Lisbon. At its core is a magnificent gothic Alcobaca Monastery or Mosteiro de Santa Maria de Alcobaca. This massive complex was commisioned back in 1138 to commemorate the release from Moorish control. Batalha is just 24 minutes from Alcobaca. This Dominican Abbey was commissioned in 1386 and took more than one hundred years to complete. The dramatic gothic architecture leaves visitors spellbound. And in true Portuguese-style, there are Manueline accents everywhere. You won’t be able to miss the towering Batalha Monastery as you arrive in Batalha, its impressive spires dominate the surrounding skyline. 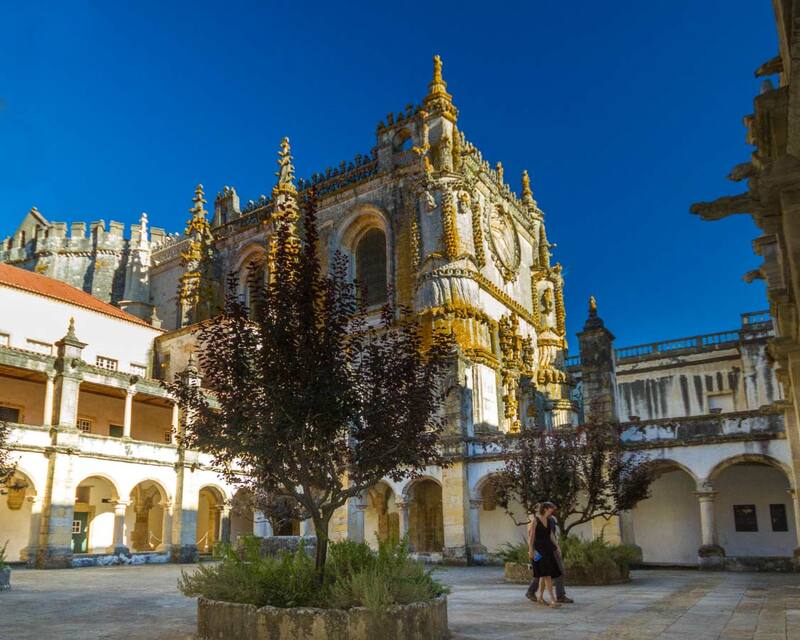 You can’t miss the historic Convent of Christ, or Convento do Cristo, in Tomar Portugal. This Knights Templar fortress is another UNESCO World Heritage Site. Its towering position on a Tomar hilltop makes it impossible to miss. While Alcobaca and Tomar are regal and elegant, the Knights Templar headquarters is barren, rough, and powerful. The building was begun in 1118 and completed 42-years later to be a show of force in the region. Not all of the day trips from Lisbon are bathed in history and culture. Some of the best places to visit near Lisbon are filled with beautiful beaches and crashing waves. 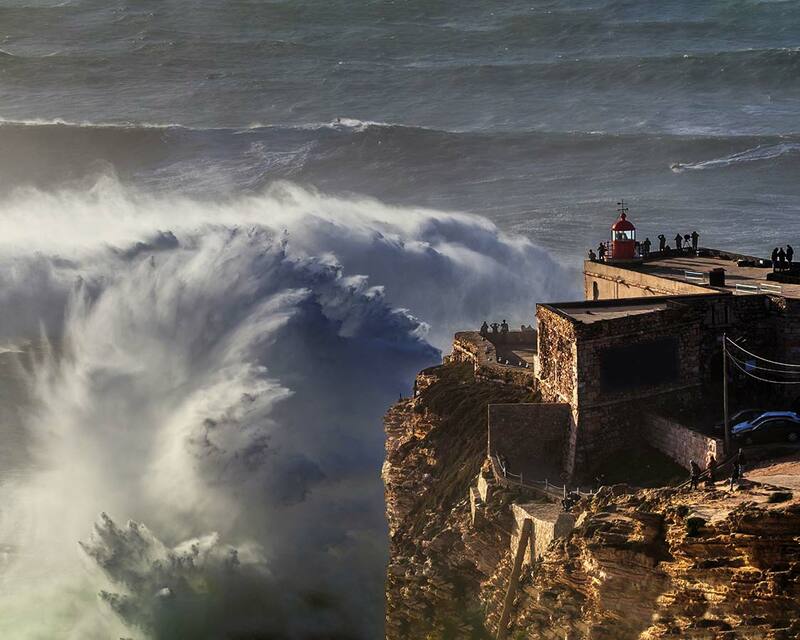 And there is no place near Lisbon more perfect for adventure than Nazare. This coastal city is home to some of the highest surfs in the world. So, it’s no surprise that surfers from all over the world head to Nazare when the waves are high to compete in surf competitions. In fact, in 2013, a record-breaking 100 ft wave was surfed by daredevil surfer Garett McNamara. Getting from Lisbon to Nazare requires either an 80-km drive or a two-hour bus ride from Sete Rios Station. Nazare has some great waterfront to explore. There are fantastic views of local surfers from the Nazare lighthouse. But, if you’re looking for calmer waters, nearby North Beach, or Praia do Norte offers golden sand and a more family-friendly beach experience. You can also visit Praia de Nazare or Nazare beach. You can choose to either walk down to the beach or take the funicular. Do you have a favorite day trip from Lisbon? Tell us about it in the comments below. Or, swing by our Facebook page and share a photo of your experience. We would love to share in your travels. Thanks for the wonderful advice! I’m keeping this post for my next trip to Portugal 🙂 Been to Lisbon twice but always stayed in the city with friends, so next time I’ll definitely go on some day trips! It’s always great to visit friends abroad! You should get them to join you!